3D. See the "non alphabetic page". 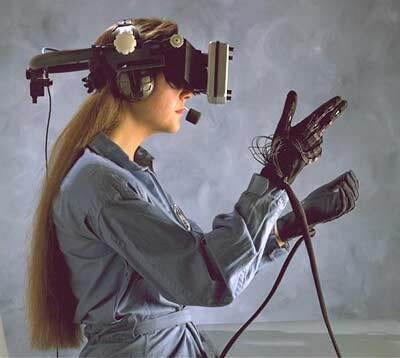 Data-gloves and goggles, typical of the virtual reality in the 1980-90's, never passed the border of specific industrial applications. They are expensive and not very easy-to-use. But cheaper and more convivial versions will appear in the future. Here a beautiful image by Purple-à-Purple. Dance, dancer, choreographer. See special notice. - Algorithms to darken images. The difficult point: harmony and coherence. Data Glove. Glove with sensors and communication to a computer system, more specifically a virtual reality system. DBN. (design by numbers). An ancestor of [Processing]. 3D. See the "non alphabetic" page. < Problématique et hypothèses de représentation de la mort artifiielle dans l'art numérique, by Geoffroy Bayon. PhD thesis directed by Hervé Huitric. Decision. Notes in ontology. See behavior, emotion. Default. Mask them, restore them [Photoshop]. Defence. A digital art of its kind. Hot subject. Degradation is used for instance in viral art, here by Nechvatal. - Images. Degradation may be a consequence of noise, seen negatively. It can also be used to enhance images. See [Bres] p. 175-176. See glitch. - Circle [Cocquerez] p. 45. - An important aspect of transmedia. - Probability density [Cocquerez] p. 9, spectral power density [Cocquerez] p. 22. - This parameter is present in many texture and model issues. See [Ebert], various pages. Dépôt légal. A french institution to aid and protect publishing. See web page. - Programming: [Brinkmann], [Foley], [Ebert]. - See pixel (bit depht of a pixel), perspective. Deriche. A contour search method. See [Bres] and [Cocquerez], who has 5 pages en the Deriche monodimensional operator. The Deriche operator is one among many tools used for contour extraction. (Here a document by Labri). - aesthetic measurement use description parameters; see aesthetics. - In a surprising book, Bernard Deloche sets proposals for a description standardization. Design, designer. See special notice. - Music. Sound design Wikipedia. - Designer baby, see [Berger-Lioret] p. 142. - Electronic music and sound design, Theory and practice with Max/MSP. by Alessandro Cipriani and Maurizio Giri. First tome (out of threes) contents: Introduction to sound synthesis and signal processing, additive synthesis, subtractive Synthesis, controls and LFO (low frequency oscillation). 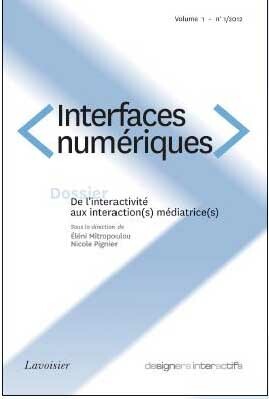 Design applied to interaction, a new review, at Lavoisier Editions . - Interaction. Web Design, may 2011 makes a portrait of Jean-Christophe Naour, senior interaction designer. His website. Detect, detection. An function of vision. For example, face detection in OpenCV. Diagram. of Voronoi, see Voronoi. Dialog, dialogue . See interaction, playability. - Dialogue tree model, see [Wardrip-Fruin] pp. 51 sq. Diameter. [Cocquerez] defines p. 36 the diameter of a region. Dictionary. List of words, alphabetically sorted, generally with a definition and grammatical classification. More in French version. - Dictionnaire des arts médiatiques by the Groupe de recherche en arts médiatiques, Université du Québec à Montréal, under the direction of Louise Poissant. Didascalia. Wikipedia (French, we find no equivalent in English). In the text of a play or the scenario of a film, complementary information written by the author for the actors or the director. - Some kinds of didascalia are found on authors CD-Roms (Pierre Morelli, in [Garbagnati]). A 3D digitization bench at centre Holo3. Digital, digitization. See special notice. - An image processing method, at various ends (enhancement, segmentation). Several paragraphs in [Bres], two pages in [Cocquerez]. - In image compositing, see [Brinkmann]. - In music: "The essence of mix and DJing lies in a capacity to dig into a same work, a same groove". [Leloup, 2013] p. 37. Dimension. See notice on Space. - [Bres]: "The unity impulsion is also known ad Dirac impulsion, or more simply Dirac". It is the basic theoretical tool for sampling. - "And so is it possible to realize a work of art with an autonomous behavior. A works that spells itself on a way adapted to every instant, each one of its spectators, still keeping its authors discours coherency... In order to fully deploy its discours, this art form needs installing itself in the ordinary flow or our life. To live with us and for us to live with it, so that it may bloom fully as a "living art". ([Aziosmanoff], our translation). Discrete, discretization. Pixelisation and discretization are forms of digitalization. [Bres] indicates some of the issues here. 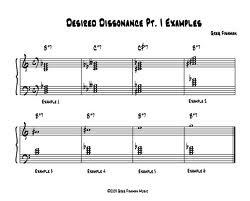 Dissonance may be explicitly looked for as a musical effect. Here an example by the Gref Fischman Jazz Studios. Display Information presentation on a screen or any other visualization device. - Discs have been used in cinetic art, for example by Duchamp. Dissipation of energy. See ecology. - In Wozzeck, by Schoenberg "The passages where dissonances are concentrated are those where abstract notions are operating. Tonal polarities, on the contrary, go with human emotions. Berg favors, on the opposete, the Mahler and Strauss method, for whom the most intense expressivity proceeds precisely from the permanent conflict between consonance and dissonance". [Ross] p. 111. (our free translation from the French edition). Distance. See our notice about space. 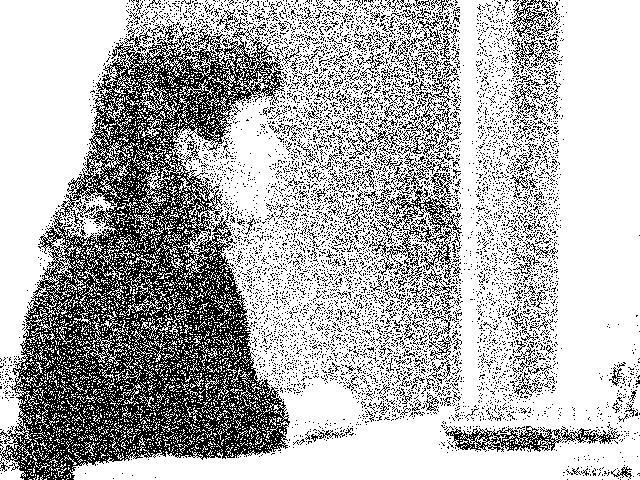 Half-tones rendering by dithering. Here using Roxame software. - "He was elsewhere, the way people were before their screens, his expression that of someone piloting something, looking into a middle distance that had nothing to do with geography" (Zero History, by Gibson). - Distributed creativity and tele-immersion, see a CCC communiqué. - Distribution of transmedia, see [Bernardo] notably a full chapter about International Distribution. - This technique is used to simulate an important number of colors from a limited palette. - A conversion method of audio data in order to store them (16 bits mode), on disc. Explanations for instance in the book Cubase, by Thierry Demougin and Eric Chautrand (Campus Press 2002). Divide and conquer. [Cocquerez]: an approach to Voronoi diagram construction. See also [Brinkmann], [Seul]. Division. See [Agoston], [Cocquerez] p. 327 for quadtrees building. 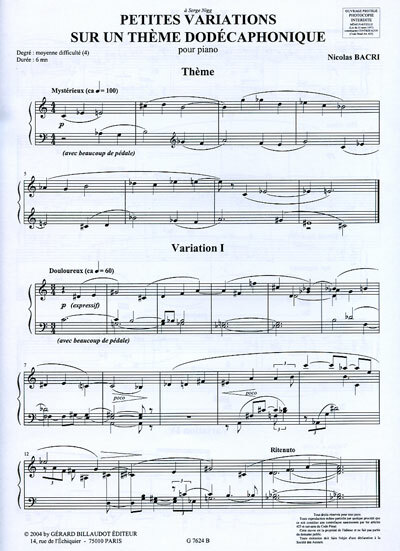 The score of "Petites variations sur un thème dodécaphonique", by Nicolas Bacri (Gérard Billaudot publisher). DJ. Disc Jockey. See night. - There are dedicated sofware products, like Digital DJ, fruit of an association between two publishers, Magix and Image Line (Sonomag, nov. 2010). - The DJ has evolved. At start, he was a mere a disc mounter, one after the other. Then, after various makeshifts, the consoles became true creation studios, including remix. And the DJ became a truly creative artist. See for example [Moorefield] p. 103-106. - Generative art aspects, see [Berger-Lioret] p. 142. - A document can, sometimes, be considered an aesthetic object. Stéphane Caro in his HDR report writes "The writing of digital documents, towards a cyber-rhetorics" does not set aside this aspect. Dodecaphonic, dodecaphonism. See more on French version. And [Ross] p. 271. - dots per inch [Brinkmann], [Processing]. - use of dot clouds to get halftones, see dithering. Draw, drawing . More in French. - A shape generation mode (hollow forms) opposed to Paint (full forms). < Where Do People Draw Lines. by Forrester Cole and al. Communications of the ACM, January 2012. < Dessein, dessin, design by Jacqueline Barral. PU Saint-Etienne 2007. - Pourquoi les jeunes artistes font à nouveau du dessin ? says Philippe Dagen (Le Monde, 3/29/2011), about some Paris exhibitions. He concludes, quoting Vincent Bioules: "from Lascaux to Picasso, drawing does not change much". - "Dessin vectoriel grunge", a two pages article plus a six pages interview of the illustrator Maxime Cyr, in Digital Artist, June-July 2010. < Femme digitale, by Michael Burns. Eyrolles. SH No 08 (biblio). < Graph drawing AH No 93 (concepts). < Le dessin symbolique rapide, guide méthodologique, by Jacques Mercoiret, L'Harmattan, AH No66 (biblio). 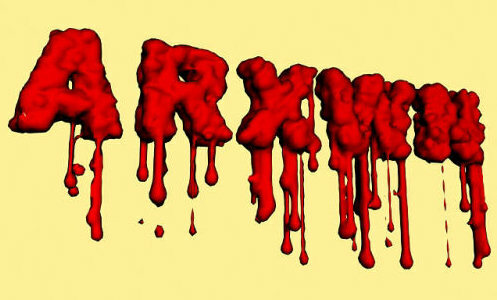 Dripping: an image from a tutorial by Arxwn, with 3D Studio Max. Dripping. A form of art typical of Jackson Pollock. It could be automated. 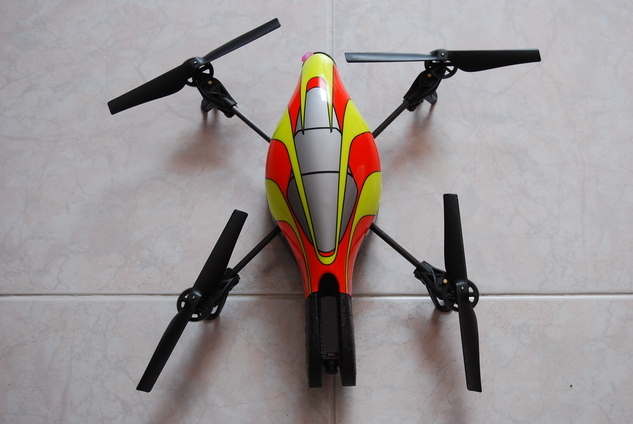 - Some notes about drones (in French) by Benoid Labourdette. - Drones are easily hacked. A note from Thiery Gaudin, 7/2012. - Drone Smart Flyer 6 by Visiofly, demonstrated in Paris, Spring 2011 (Sonovision, April). - Ardrone Parrot, presented by Fnac, 2010. Only for Macintosh computers. < Kill Decision. by Daniel Suarez. Dutton 2012. A SF novel where swarms of drones threaten to destroy the World. Dub, dubbing. At stard a Jamaican practice, introduced by the sound engineer King Tubby. - More on the French version. Drone: the Parrot (Apple) for photography. - for graphics: dynamics expansion [Cocquerez] p. 66. This image enhancement method is easy to be programmed and gives (not always) good results. Besides, it reduces rounding errors on ulterior processing. See also [Foley]. - for music: evolution aptitude of a sound. For example "the dynamics processors receive a control signal, filtered or not ".